Last May, early in the morning on a sunny Sunday, I wandered about the Heygate Estate which is slated for demolition. It was quiet and I could hear birds. The plants and trees seemed to be taking over again; the green was sometimes almost fluorescent. Relative sanity today – went to the Tate with my lovely friend Fran to see the Picasso. The premise of the exhibition was his influence on British art. The only problem being that everything British looked such complete and utter dreary crap compared to him. The real eye opener were some truly exquisite designs for stage costumes which I had never seen before. The photographs of him always remind me of you for some reason. February 19: with the lovely Richard to hear a wonderful programme of Percy Grainger. PG was Australian and had a great interest in music from the Far East which played a great part in some of his compositions. Always of interest to someone of my mixed background. Here is PG’s take on Dowland’s “Now Oh, Now” – the original plangency remains but with a bitter-sweet edge. Pianist Penelope Thwaites from Vol III of Grainger’s complete piano works. The Hermit has finally come out of hibernation. Had to meet someone at Loughborough Junction on this wet and dreary morning so was very pleased to find The Beanery – a new cafe which has opened by the station entrance. Very cheering. Had a lovely breakfast of milky coffee (from the Monmouth Street Coffee shop – taste the difference!) and delicious rye bread and jam (warmed in the oven so toasty on outside – real butter and Bonne Maman jam – and you can help yourself, how civilised). One small detail; I had left all my money at home (yes, that old trick) but they could not have been nicer and said it was on the house. So thank you for a warming and heartwarming breakfast Sabina, Coisa, Lucy, Vincente et al – and Good Luck hope it all goes well! A bright spot on a dull morning. An exhibition of artist’s books and mixed media works on paper that explores how contemporary artists are referencing traditions associated with 17th and 18th century botanicals, herbariums and natural histories, to comment on economic and environmental issues. Mandy Bonnell is currently working on a project based on the collected works of the Victorian botanist Miss Rowe, following a residency at the Alber’s Foundation in 2009. The delicate lines of Miss Rowe’s plant studies are echoed in Bonnell’s hand-coloured drypoints, which have been made as studies towards a large-scale artist’s book. Tracey Bush’s Nine Wild Plants series examines the correlation between brand recognition and the diminishing knowledge of indigenous flora and fauna. The fragility of threatened species is hinted at in the blue Rizla butterfly that hovers in her tiny paper sculpture The Art of Rolling 2010. Mich Maroney’s Solstice is a photographic record of a nature reserve on the banks of Deptford Creek. Inspired by medieval books of hours and The Garden Kalendar of naturalist Gilbert White, this contemplative work documents the passing of time through the changing atmosphere of weather, landscape and tides. 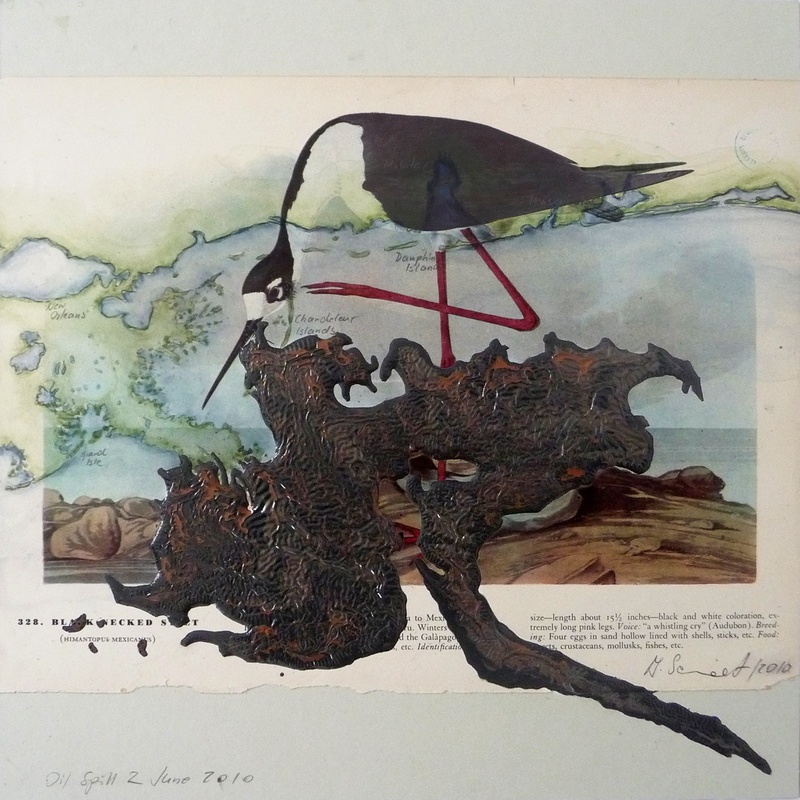 Alke Schmidt’s Birds of America series was prompted by the disastrous effect of the BP oil spill on the wetland habitats in the Gulf of Mexico. Working on found pages of a reprint of James Audubon’s famous book, Schmidt traced the original habitats of these species, some now gravely endangered. Intrigued by the shapes of the oil spill Schmidt painted ‘spill’ maps over the ‘rescued’ prints. Ruth Simon’s ambitious publication Kapa Kapa uses the contradictions of the conservatory plant Medinilla magnifica as a metaphor for human behaviour. Screenprinted in the form of a wallpaper sample book, with 60 images, Kapa Kapa explores migration, invasion and cultural erosion.